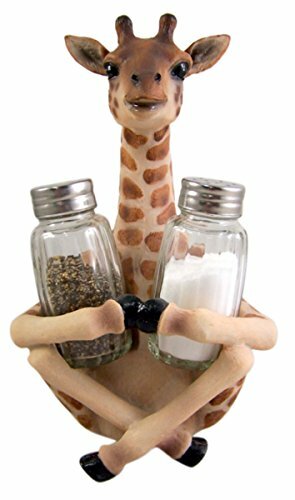 Size: 4 3/4 Inch (L) x 4 Inch (W) x 8 1/4 Inch (H), Giraffe Holding Salt and pepper Shaker Table Decor, Figurine is Resin, 1 Salt and 1 Pepper Glass Shaker Included - 3 Inch (H), Create a Safari at the Dinner Table and let This Giraffe Hold Your Salt and Pepper Shakers. If you have any questions about this product by Giraffe Kitchen Decor, contact us by completing and submitting the form below. If you are looking for a specif part number, please include it with your message.